Discover how to value the best stocks and buy them for less than they're worth. 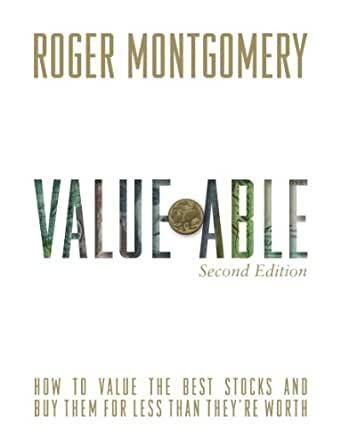 Demonstrating that market-beating returns are possible and within the reach of all stock market investors,Value.able sets out Roger Montgomery’s three simple steps to successful value investing and online trading. Follow them yourself and you too cannot help but do well, beating the market over the long term. Financial commentator Alan Kohler described Roger as one of the nation's smartest and most successful value investors. Regularly appearing on CNBC, Sky and Bloomberg, Montgomery is the go to guy for business perspective investing. Value.able is overflowing with the latest cutting edge interactivity, video commentary from Montgomery himself, screencasts from his trading desktop and animated examples of listed companies that meet his criteria and earned him some of the best fund returns. Instructive and entertaining, make 'Value.able' the most valuable investment guide book in your library now. Roger’s book is a great summary of the keys to value based investment. He provides an excellent framework for investors to analyse and value companies to decide whether they are of appropriate quality and price to include in their portfolio. His valuation model gives investors a simple tool to determine at what price there is a sufficient margin of safety to buy a high ROE company if they are to achieve their predetermined minimum level of return. Very enjoyable read. Great book on the topic of Value Investing. It not only gives you the tools to be able to asses the intrinsic value of a business, but also explains at great length why this is important. Roger also debunks alot of the popular methods used by analysts and stock market commentators. If you are going to buy stocks you must read this book. Otherwise you will be guided by wrong metrics and losing constantly. A few years ago I attended a class at Columbia Business School and seated next to me was this very nice Australian. When I at one point asked about his favorite investment book he pointed to Value.able by Roger Montgomery. Later on when I read the book my expectations were perhaps set a bit too high. It is a no-nonsense book on value investing, highly influenced by Warren Buffett and mainly directed towards the private investor. It covers the same compounding, margin-of-safety, seek high cash flow, invest with good managers and “only swing at the fat pitch” type of topics that you will have read in many other books. However, the text grew on me while I read it. The author who is an Australian value investor writes with a passion and pathos that is contagious. Montgomery really wants the reader to understand the power of the well-used value investing tools and abandon faulty and myopic rules of thumb that too often destroy value rather than help create it. A number of case examples from Australian companies bring the concepts to life. Like Buffett, Montgomery’s timeline is to first identify the great businesses to own and then wait until they temporarily get cheap enough to add to the portfolio. The book proposes two methods for valuing stocks to the reader. 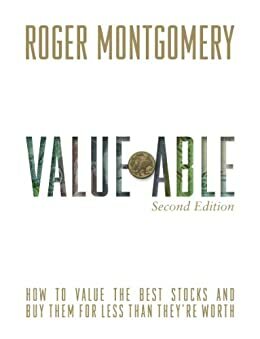 The first is by using two valuation tables presented in the book where Montgomery basically calculates a fundamentally fair price-to-book multiple given varying levels of ROE, required return and payout ratio and then multiplies this fair multiple with the book per share to receive an estimate of intrinsic value. Unfortunately the tables are scarcely explained with regards to the underlying formulas that generate the fair multiples. The second method is to assume a purchase of a share year zero and a sale of it in year five and calculate an internal rate of return for the holding. This method requires assumptions about ROE, payout ratio and future PE-ratios but it’s quite elegant since it doesn’t require a cost of capital. It doesn’t produce an estimate of intrinsic value. Instead the investor will have to ask himself if he is content with the predicted IRR. This second way to approach valuation has become more fashionable among value investors and it is, as I understand it, how Buffett approaches valuation. I like the model’s simplicity and the fact that it so clearly shows the value creating effects of the compounding of return on capital, the headwind or tailwind generated by normalizing PE-ratios and the fact that giving out dividends either destroy or create shareholder value depending on the level of ROE that the money could have been invested at in the company. The book could do with some editing. The author’s eagerness to explain the virtues of his investment principles makes him return to the same topics a bit too many times in various parts of the book. Also, for the novice reader it is probably a bit confusing when someone presents two principally different methods for stock valuation - especially as the second one isn’t discussed much when the author covers his general investment rules. What are the investment rules? In short the reader is advised to only look to the better half of the investment universe, i.e. companies with an understandable moat, high and sustainable ROE and low debt. Among the remaining stocks the ones that combine improving corporate prospects with a stock price that is lower than its intrinsic value are candidates for the portfolio. For the long-term investor with the stomach to be greedy when others are fearful Montgomery gives some simple but effective advice.